I have posted about this rose before but with the autumn sun illuminating the masses of hips the other day I thought it time to give this brilliant hardy shrub the attention it deserves. Rosa glauca is a native to southern Europe east into the Caucasus and has been cultivated in Britain for at least 200 years. 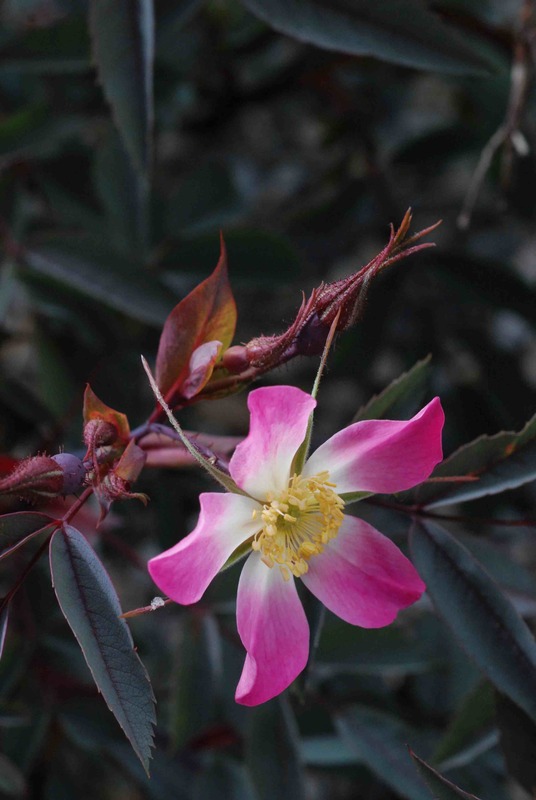 As a garden shrub it has many desirable qualities although as a rose you may find it disappointing; it has small, rather fleeting flowers that have very little scent. It is a medium sized shrub, reaching about 2m in height and spread and is lightly thorny, almost thornless on the young shoots. The main reason to grow it is for the wonderful purple leaves and stems that are covered in a white, waxy bloom that is most prominent on the young stems. It is difficult to describe the colour of the leaves because they are basically beetroot red, especially on the underside, but overlaid with a steely grey on the upperside. Like most coloured-leaf shrubs, the best leaf colour is produced when this shrub is grown in full sun but partial shade is tolerated. The flowers are carried in small clusters along the previous year’s stems and the petals are rather narrow and usually white at the base and rich pink at the ends, all augmented by a cluster of yellow stamens. Almost as notable as the leaves are the sepals on the flowers which are long and narrow and extend beyond the petals, giving the flowers a lovely starry appearance. These fall off soon after the flowers fade and are not present on the ripe fruits. So, this shrub gives your garden lots of interest from the moment the leaves emerge in spring with a burst of extra colour in June and then settles down to provide attractive leaves all summer until the hips ripen. They do not last as long as some others because they are soft and juicy and very palatable to birds but that is another reason to grow it. I also find that mice like the hips too and often find a mound of eaten hips around the garden. This is one way that the seeds find their way in different places – birds spread them too – and you will be very unlucky not to get some free seedlings after a year or two. If you want to make more plants then collecting and sowing seeds is the best way. 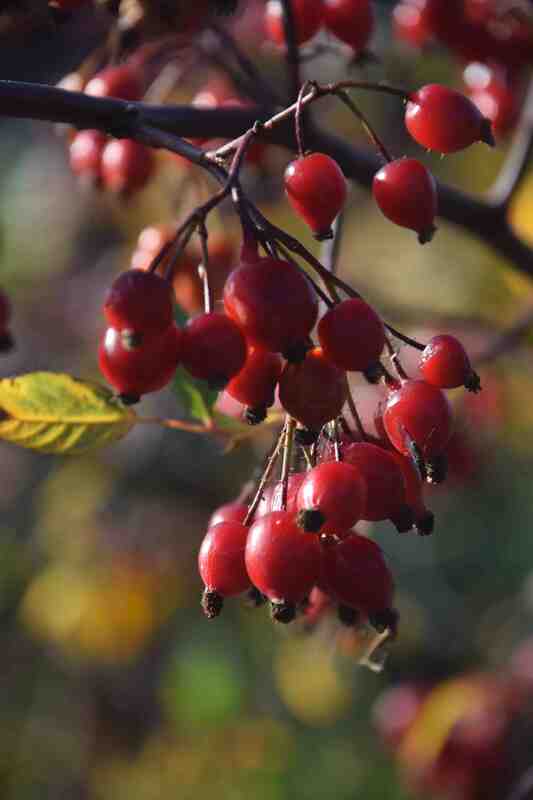 Collect the hips and mix them with wet sand and put them in a plastic bag and leave it in a shed or the bottom of the fridge for a month and then crush the rotten hips into the sand and sow the lot in a row in the garden in winter, covering the seeds with about 2cm of soil. With just a bit of luck you will get masses of seedlings in spring and they can be transplanted the following autumn to their final spot and will be flowering away in just another year or two. You can plant this in almost any soil as long as it is not bone dry or saturated and it doesn’t mind clay either. No formal pruning is necessary and you can cut out a few of the oldest stems every now and then to keep it young and smaller but I always keep the plants smaller because the young, almost thornless, stems are great for cutting to mix with flowers in summer. Another thing worth mentioning is that this is pretty free from disease. It may suffer from mildew a bit in poor, dry soils but on this batch of plants I have as a hedge, 40 in total, there has never been a sign of mildew or blackspot. It is a good choice for a loose hedge or you could easily mix some into a nature hedge with hawthorn and sloe. 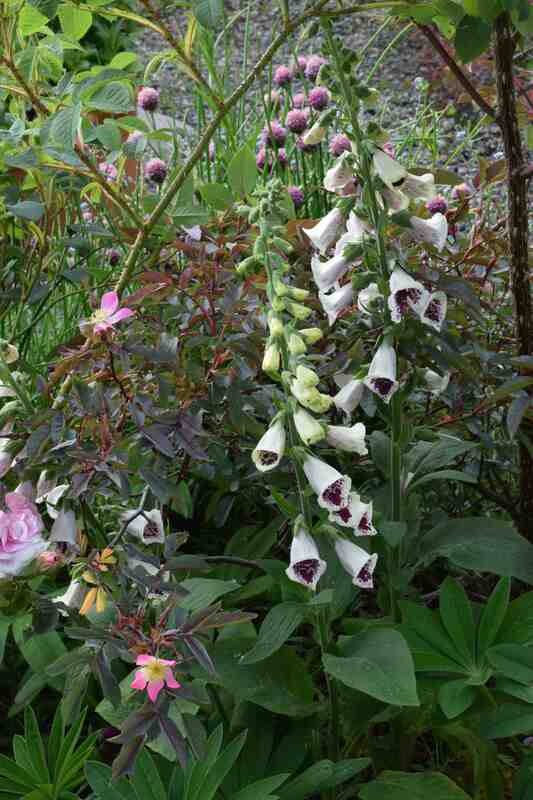 But it is also a good shrub for a mixed border and the colourful foliage is the perfect foil for other plants. What I especially like about the leaf colour is that it is not as artificial as some purple-leaf shrubs and doesn’t stand out like a sore thumb. The greyish tints the foliage make it perfect with grey and white plants – think brachyglottis ‘Sunshine’ for an easy pairing or white Japanese anemone for late summer joy. But it also works with hot colours and you could use it as the basis for a fiery border with red dahlias, cannas and rudbeckias – the list is endless. I couldn’t agree more. It is a gem. One of my favourites too, such an understated beauty. 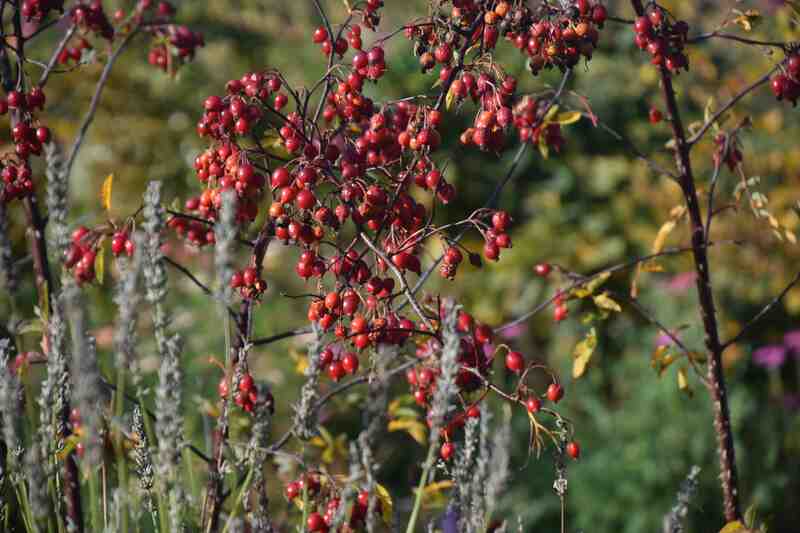 i have a North American wild rose called Rosa setigera, but R. glauca has it beat in terms of quality and quantity of hips. thats the problem – do we feed the birds or our eyes? I got locked out of my laptop, so am reading all my back mail rather late. What a divine photo of the flower. I never noticed that the sepals were so long though I had noticed the starry appearance. I will study more carefully next year! I had collected a few hips from an arrangement I did ages ago and will try out your method, although I do find occasional seedlings. Though my berries were good this year – yours are fab. 10/10 from me too.